A woman from Philadelphia was accosted and repeatedly punched in the head by police officers in New Jersey as she sunbathed on the beach during Memorial Day weekend shocking footage online shows. 20-year-old Emily Weinman was with her friends and family, including her 18-month-old daughter, when she was confronted by the officers after they believed she and her friends were drinking. In a now deleted Facebook post, Emily shared the details which are now being investigated by police, CBS Philly reports. I had alcohol, it’s Memorial Day weekend and 90 per cent of people are underage drinking on the beach, without a doubt. Two cops approach me on a their four wheelers and ask me and my friend how old we are, we gave them our ages. Then, we got breathalized, and it came back negative. I told them I wasn’t drinking and the alcohol was clearly closed/sealed, which the cops seen. However, after cooperating with the police and passing the breathalyser test, the officers still stayed nearby. They even, apparently, followed Emily as she walked away to make a phone call. Their continued presence obviously had an impact on Emily and her group of friends, as it was then things escalated. I asked them don’t they have something better to do as cops than to stop people for underage drinking on the beach, saying that there’s much more serious stuff going on… the cop said, ‘I was gonna let you go but now I’ll write you up,’ and he asked my name. As the Daily Mail reports, Emily said that she ‘didn’t do anything wrong, and anything could’ve been written down on that paper so I wouldn’t give it to him’. Despite her telling the officers that she was at the beach with her young daughter, the police still said they were going to arrest her. [The policeman] told me he’s arresting me and started coming towards me to put handcuffs on me. I cautiously was backing up from him (facing him) and yelled for my daughter’s father. 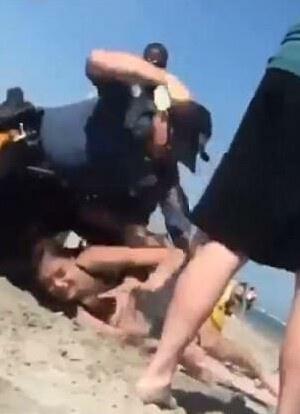 It was then that Emily ‘tripped and fell and the cop tackled me to the ground and smashed my head into the sand’. That’s when he head locked me by [putting] his arm around my neck, punched on me in my head and then he head locked me again but this time choking me, I was gasping for air. 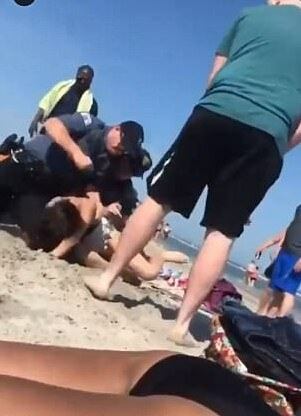 The footage shows the officers wrestling Emily on the ground, handcuffing her and telling her to ‘stop resisting’ as beachgoers and friends of Emily try to help. Her daughter can also be heard crying in the background. Emily later admitted that she should’ve given the officer her name to avoid the incident, but ‘the whole situation was iffy and I didn’t trust it,’ she said. Emily, who said she had not been drinking, said she shared the video because the incident ‘was handled wrongly and blew out of proportion,’ and believes that the police were there just ‘to stir the pot’. Wildwood Police are investigating the incident.